When you head the word "mummy", what do you think of? For me, the first thing that comes to mind is Ancient Egypt. But did you know that the oldest mummies found were in South America, not Egypt? 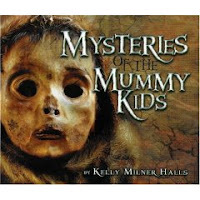 In Kelly Milner Halls's informative (and kind of creepy) book, I learned about mummies from all over the globe. Some people were mummified "accidentally" on cold mountains or arid deserts that dried out the bodies. Some people were mummified on purpose and different cultures had different processes for mummifying bodies. Halls concentrates on child mummies and these children died in many different ways. Some ancient Incan children were sacrificed to the gods. Some children may have been killed because of their physical disabilities and some children died of diseases. The book is divided by location and describes mummies found in South America, Egypt, Europe, Asia, and North America. Each mummy has its own story and Halls describes how it was discovered, the scientific process of preserving and studying it, and what scientists have learned from the mummies. Each mummy found gives us a glimpse into ancient life (or, as in at least once case, American life in the Civil War...). Color photos accompany each mummy. Halls includes an extensive bibliography of books, articles, websites, interviews, and more. She also includes a glossary, list for further reading, and a list of US museums that house mummies. This would be a great book for kids doing projects on mummies (especially non-Egyptian mummies) and it's high-interest enough to be recreational reading for those that favor books that are a little gross. Although it creeped me out more than a little, I enjoyed this title (and I suspect kids will enjoy it, too). I'll definitely be checking out more of Kelly Milner Halls's work. Thanks for the great review. If you read the introduction, you know I was inspired to write the book by the same "creeped out" feeling you experienced, when I was a kid. Mummies scared me and made me sad. So as an adult able to ask the questions I couldn't ask as a child, I set out to dig deeper into the unknowns, to explore the lives of these people, beyond mummification. I felt lonely for mummies when I was a kid, sad that all we knew was how they died. And while I'm pleased the book will appeal to reluctant readers who like the "creepy" factor -- I was one of them -- I'm also hopeful that some of the fears will be eased once those haunting questions are answered. Thanks SO much for the great review. There is lots more yet to come. I hope I can keep your readership. I'll do my best.